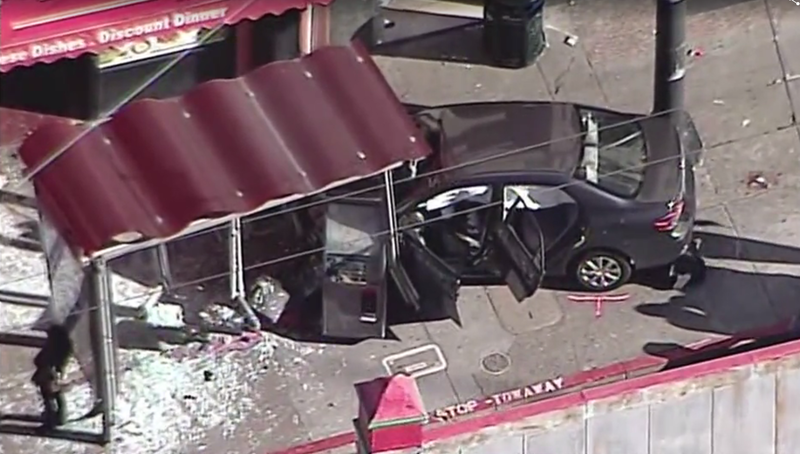 SAN FRANCISCO -- A car involved in a chain-reaction crash careened into a crowded Muni bus stop in San Francisco’s Chinatown Friday, injuring 10 people and leaving glass and debris scattered all over the street, CBS San Francisco reports. There were few details, but the San Francisco Fire Department said that a vehicle had crashed into a bus stop at Stockton Street and Sacramento Street at 12:37 p.m.
San Francisco Fire initially confirmed that five people were injured. A later tweet increased the number of injured to 8 and noted that five had “major injuries,” but authorities later upped the number of injured to 10. Supervisor Aaron Peskin, who represents Chinatown, told the San Francisco Chronicle he saw bleeding victims. The five victims with the most serious injuries were taken to San Francisco General Hospital, according police spokeswoman Officer Giselle Talkoff said. The other five victims were taken to other hospitals in the city. It was not immediately known what caused the car to lose control and drive into the bus stop, Talkoff said. Shattered glass covered the sidewalk at the site of the crash, which caused part of the bus stop to collapse. Authorities later confirmed that two of the victims had critical injuries. The driver of the vehicle remained at the scene and Talkoff didn’t know his condition. She said the collision appears to be accidental, but it remains under investigation. Police later confirmed that the driver, a woman, was cooperating with the investigation into the accident. San Francisco Police later said that the car that hit the bus stop was traveling on Stockton Street and apparently lost control, hitting an unoccupied parked car and another car that was moving before plowing into the Muni stop. Police and fire units remain on the scene. CBS San Francisco will report additional details as they are made available.